Today, feeling drifty and pleasantly melancholic as befits the season, I went looking for an apt quote to accompany my two autumn pictures, taken earlier this week on a glorious, cooling, sunlit autumnal walk toward my office at the far edge of lovely Kelvingrove Park, Glasgow, Scotland, UK .Here is the quote, from one of my favourite poets, e.e.cummings, born, appropriately, on 14th October. For me, it strikes the right notes of simplicity, power and bleakness. 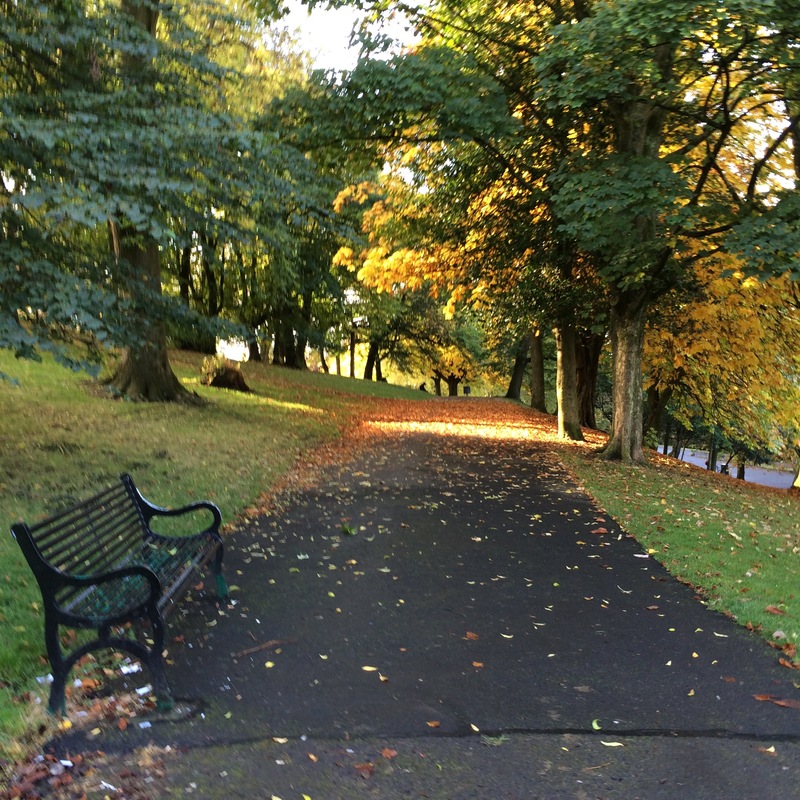 This entry was posted in 01 - new Posts: January 2015 onwards, Healing - the power of Nature (article archive) and tagged Autumn, e e cummings, Kelvingrove Park Glasgow, October. Bookmark the permalink. 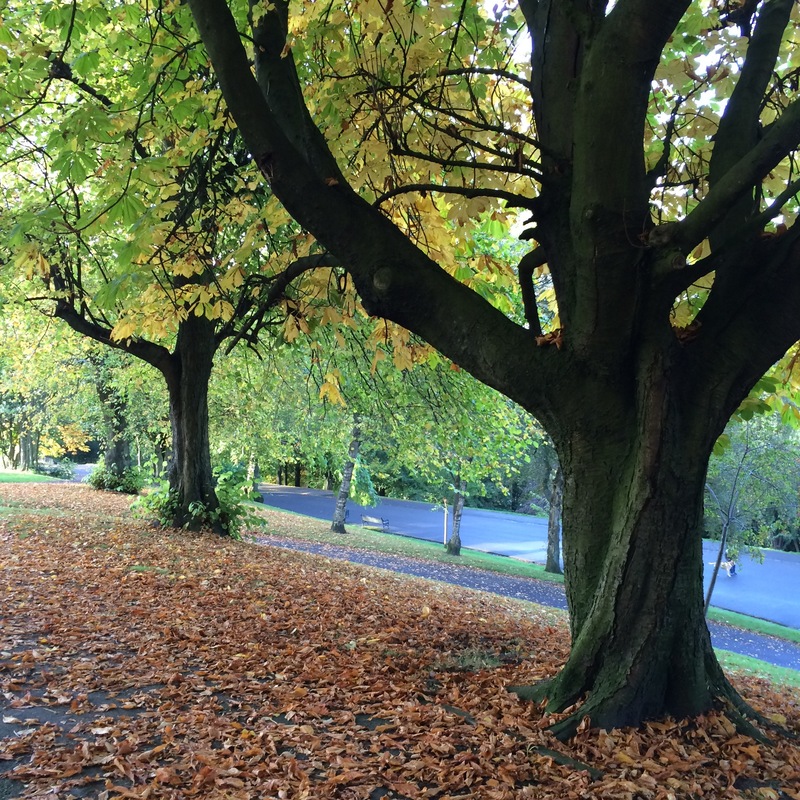 I was in my thirties and living in an arid zone, when I realised how much I liked autumn, and how much I was missing it. Eventually, I moved to where the four seasons could be expected, and yes, the green stubble of fresh grass after opening rains coming through the land baked by summer’s fierce heat is such a relief. Lovely photos 🙂 And now I see I share something with e.e.cummings…..
How grateful I feel for earlier generations who set aside land for city parks and created these havens of joy for us who have come after. Fabulous photos of a place that helped to heal my spirit all those decades ago – along with the Botanic Gardens. And it was largely you Anne, gave me the strength to start on that new journey through Glasgow. Full circles in the autumn of our lives. I well recall our meanders through Kelvingrove with your little boys all those years ago. And thank you for your kind words. Much appreciated. It’s interesting that we all experience autumn, and yet autumn has come to be defined for many of us in very specific ways: the colorful leaves, certain songs and poetry, and so on. Eremophila’s comment reminds me that in the antipodal regions of our world, the sights and sounds of these months are quite different. They’re experiencing what we shall in onlly a few months more. Ah, the incomparable, the unique voice of Miss Dickinson! Thank you for sharing this exquisite gem, Linda. the photos are beautiful. i pondered the post and thought, “Autumn? I’ve forgotten about autumn!” surrounded by gingers, heliconias and other exotic tropicals, i truly had forgotten about the change of seasons! autumn is special..i hope that it stays lovely and lingers before winter begins where you are. Many thanks, Lisa – your feedback on the photos is appreciated especially since yours are so vivid and give such a wonderful picture – disrupted and painful though things are there at present – of the unique flavour of where you live, and especially of the warmth and vibrancy. Beautiful quotes and photos! So nice to have found your blog! You too. Autumn is just wonderfully magical so enjoy.